Contagion, or the way disease, disgust and dirt circulates, how the effects of dirt transfer to bodies, and how harm is conceptualized, is central to discard studies. From miasma, through the germ theory of disease, and now for chronic, pervasive models of pollution brought about by endocrine distributors and radiation, theories of contagion have been closely linked to waste and filth, both in material and cultural senses. 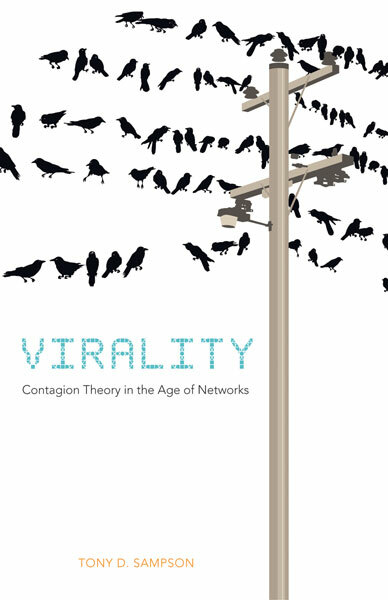 Sampson’s Virality relates to work such as Douglas’ Purity and Danger, and Bowker and Star’s Sorting Things Out, where a theory of the viral, or the mechanisms by which contagion travels, is both sociological and mimetic (though, often not all that material). In this thought-provoking work, Tony D. Sampson presents a contagion theory fit for the age of networks. Unlike memes and microbial contagions, Virality does not restrict itself to biological analogies and medical metaphors. It instead points toward a theory of contagious assemblages, events, and affects. For Sampson, contagion is not necessarily a positive or negative force of encounter; it is how society comes together and relates. Sampson argues that a biological knowledge of contagion has been universally distributed by way of the rhetoric of fear in the antivirus industry and other popular discourses surrounding network culture. This awareness is also detectable in concerns over too much connectivity, such as problems of global financial crisis and terrorism. Sampson’s “virality” is as established as that of the biological meme and microbe but is not understood through representational thinking expressed in metaphors and analogies. Rather, Sampson interprets contagion theory through the social relationalities first established in Gabriel Tarde’s microsociology and subsequently recognized in Gilles Deleuze’s ontological worldview. According to Sampson, the reliance on representational thinking to explain the social behavior of networking—including that engaged in by nonhumans such as computers—allows language to overcategorize and limit analysis by imposing identities, oppositions, and resemblances on contagious phenomena. It is the power of these categories that impinges on social and cultural domains. Assemblage theory, on the other hand, is all about relationality and encounter, helping us to understand the viral as a positively sociological event, building from the molecular outward, long before it becomes biological. This entry was posted in Disease, Purity/defilement and tagged ANT, contagion, networks, Tony Sampson, virality. Bookmark the permalink. Pingback: CONTAGION IS HERE!! | News That Matters To Me.